A forked front design, developed to reduce numbness and increase contact points with ‘sit bones,’ makes the ISM (Innovative Saddlemaker) bicycle saddle distinctive in both look and feel. When I first tightened down the PS1.1 – abbreviated for “performance short” – I was skeptical at best. If safety is the number one concern among would-be and experienced cyclists alike, then saddle discomfort is a close second. 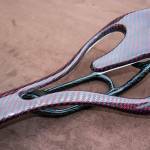 Numerous companies attempt to tackle this problem, creating harder saddles, wider saddles, softer gel saddles, even foam seat covers. Yet there is little consensus on an ideal design. 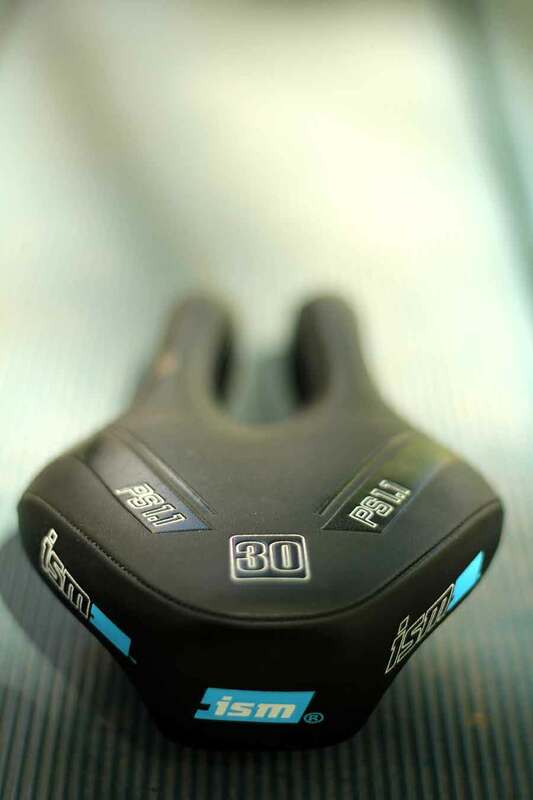 ISM founder Steve Toll opted to alter the saddle’s basic profile, splitting the nose – which is crucial for bike control – to relieve pressure on the perineum (the soft, sensitive, and very private area) and, in turn, the pudendal nerve and artery. Pressing on this area for extended periods is the culprit behind the, at times extraordinary, discomfort and numbness that results from longer rides. I expected this unusual saddle to garner attention from fellow riders, which it did. What I did not expect was the immediate and substantial difference in the general feel of sitting on it. While the company touts the relief the saddle provides, my first impression was the firm pressure and shifted contact points, not pleasant at first, but once I became accustomed, it vastly improved the sensation of riding. The “independent front arms” necessitate the saddle seating farther back in the rails and resting up to 5 mm lower. This dramatically altered where my sit bones – if you’re not shy, go ahead and feel around, that’s what is supposed to be pressing on the seat – rested on the surface. All of my weight settled into these dual contact points – not on the arms themselves, but on the saddle surface alone. Hurl Everstone, another GearJunkie writer and bike tester, put the saddle through his own paces and had similar impressions. The PS1.1 is built for time trial and triathlon bikes, where aggressive posture – leaned forward and down – is expected. To accommodate this, the PS1.1 is shorter in length, 245mm, and the rear section slopes upward to provide hip support. I tested it on my track bike, in sprint positions, but also around town with more upright posture. In total, rides lasted anywhere from 15 minutes up to an hour. The saddle felt more “in touch” with my bottom during the rides, unlike traditional saddles, which after time tend to settle into the crannies. At no point did I have to hop out of the saddle and adjust my posture. Plus, the light to moderate amount of padding – ISM rates the PS1.1 at 30 on a hardness scale of 15-60 – was firm enough to keep me from slumping down. Those who prefer cushy seats probably wouldn’t like the pushback of this saddle. For my needs, riding hard, short sprints, the 9.6-ounce PS1.1 was fine, but it is a bit bulky. For triathlons, especially time trials, it is probably too substantial for high-level riders. While the chromoly rails do add to the relatively hefty profile – ISM offers a performance short model with lighter titanium rails – it’s more the wider nose (arm) section that creates this feel. ISM does have a performance narrow line as well. Despite the brawny feel, which does take some getting used to, the noticeable hip support and solid sit bone contact makes rides – particularly in aggressive sprint positions – more comfortable than with many saddles I have used and easier to sustain for longer periods. For fast riders who regularly experience numbness and pain from extended rides in a forward position, the dual-arm design of ISM saddles is strongly recommended. Though the PS1.1 is heavier and wider than elite-level saddles, ISM has similar no-nose product lines that cater to ounce-weenies. The same is true for recreational fair-weather riders who have difficulty getting comfortable on their bike. 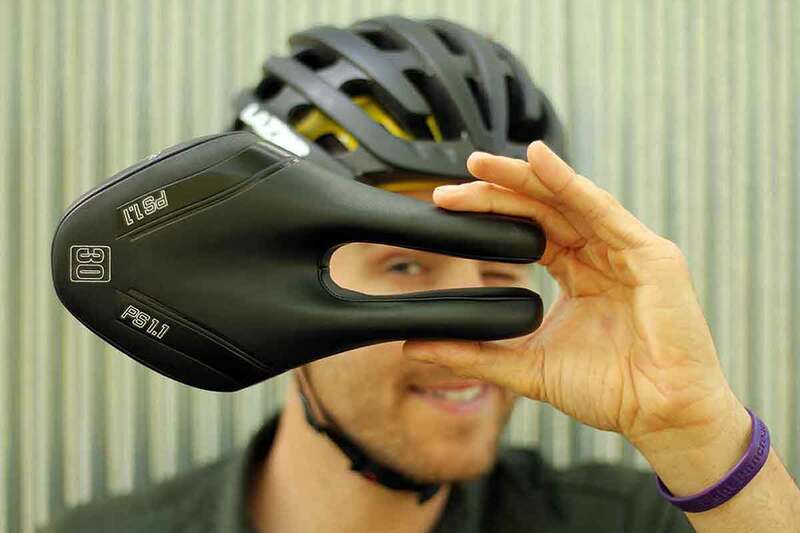 ISM runs the gamut of saddle sizes and softness, with the same perineum-saving design. The only catch for all of these demographics is price. 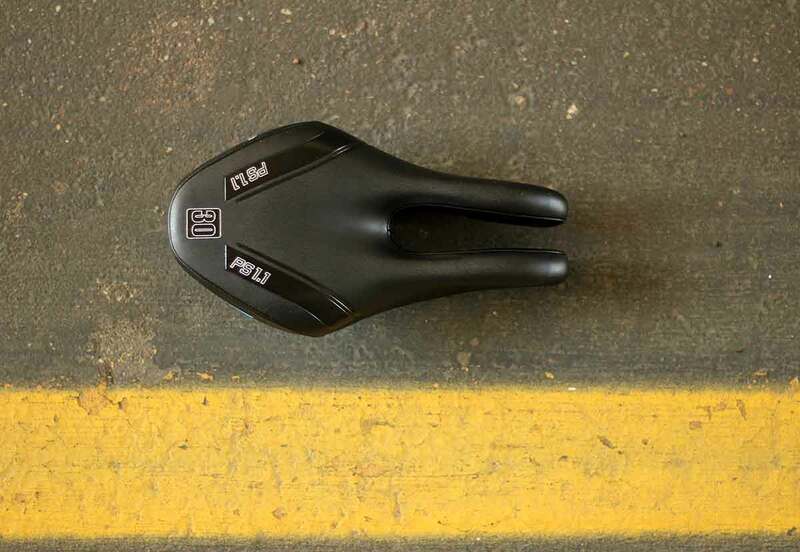 ISM’s patented technology starts at $85 – for the largest “police bike” saddles – and tops out at $260 – more than many carbon fiber seats that weigh a third of the performance saddle I tested. The PS1.1 retails for $190 – steep, but for serious riders who are consistently in the saddle, I say it’s a worthwhile investment as the cost-per-use goes down with each ride. And there is no substitute for not being in pain.